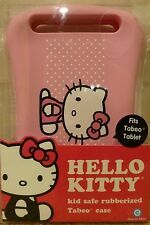 Hello Kitty Tabeo Tablet case, and it is made of durable rubber - NIP. Fits Tabeo Tablet. 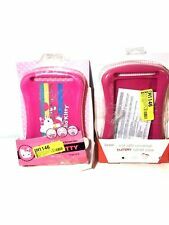 Hello Kitty Tablet Case. Kid Safe Rubberized. Light weight rubberized protection. About a 7" Tablet. Fun & kid friendly. Color: Pink. If you don't a unpaid case will open on the 5. Child friendly, & Elderly friendly. Great protection for iPad. two for the price of one. Great for Christmas.